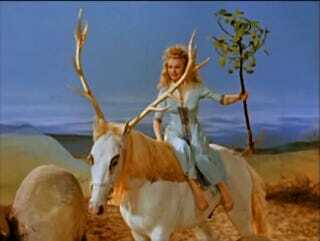 Few trees can sing, fewer still can ring, so you can appreciate 1957's The Singing Ringing Tree (Das singende, klingende Bäumchen) is pretty extraordinary. It’s a lovely, strange, not entirely well written fantasy film. Very loosely based on a Brothers Grimm story, it comes off as a less coherent version of Cocteau’s Belle et la Bete and with some of the visual beauty of Soviet fantasy films of the time; maybe it’s not a coincidence it comes from East Germany. But I watched a version that became well known in the UK—not exactly dubbed but with a simultaneous translation from an English narrator. This is very similar to the common method of translating films in Russia to-day. It may be the best compromise for people who can’t read subtitles but don’t like cheesy dubs of foreign films. A handsome prince (Eckart Dux) shows up at a castle one day where he asks to marry the beautiful princess (Christel Bodenstein) despite the fact that they’d never met before. Presumably there are political reasons for the marriage but they’re not mentioned. Anyway, she has the temerity to refuse marriage right away to a total stranger and tasks him with finding that weird titular tree. And he finds it. Pretty quickly, too, in the hands of an evil dwarf (Richard Kruger) who gives it to him on the condition that, if the princess doesn’t love him on receiving it, the prince will turn into a bear. So of course he turns into a bear. Or something like a bear. Maybe a little more like Lon Chaney Jr. What’s life like as a bear? Pretty much the same as life as a man except now all the forest animals love him and he loves them in return for some reason. Even the fish—he’s shocked when the princess empties a pool to leave a dozen koi to die. That doesn’t stop him from carrying her off, though, and from here the bulk of the film focuses on her as being forced to live with the bear teaches her humility. A worthy enough lesson though one might wonder why the prince wanted her so bad in the first place. Belle was kind and intelligent, this princess doesn’t seem worth the effort, if strange, giant, googly eyed fish and golden stags are even up to the task. But Christel Bodenstein in the role is a delight. It’s a pleasure watching her in this Technicolour dream with its beautiful, shiny, saturated sets and costumes. It’s available on Amazon Prime. Connected drops of moving rain return. As buckets draped on tired shoulders sag. Collapsing silent dancers dip in turn. As pictures taken slow for evening lag. Attuning pictures gained a crystal look. Throughout the square the giant watches chimed. At corner points you’ll see another rook. Aggressive lists were writ and slowly climbed. Collected braids of living smoke emerged. The written time consumed the blackened wall. A daffodil and figure slowly merged. A pollen rain displaced the airy mall. To stop a saxophone the angels ran. A garden riot pushed the flower Pan.